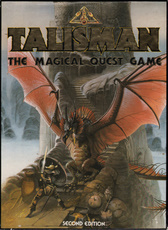 "TALISMAN is a game played in a mythical world of dragons and sorcery. As a warrior, wizard, priest, or one of eleven other characters with special powers, each player must set off on a quest to find the magic, talisman. The journey will be filled with danger -- monsters, traps and evil beings are waiting to defeat your player-character. With skill and luck you will survive to find the greatest treasure of them all. Only then will victory be yours. • 1 full-colour Playing Board depicting the magic kingdom. • 14 full-colour Character Cards detailing Special Abilities with 14 small, matching full-colour Cards and 6 plastic bases to represent the characters on the board. 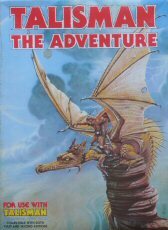 • 104 full-colour Adventure Cards detailing monsters, treasures and other items. • 24 full-coluur Spell Cards detailing the spells which may be cast. • 28 full-colour Purchase cards detailing the items that may be bought. • 4 full-colour Talisman Cards, 4 Toads, and 4 alignment Change Cards. • 1 six-sided Die for movement and combat. • Clear and concise rules." Expansion adds 14 new characters, 6 new spells, and 36 new Adventure cards. Also includes Talisman poster. 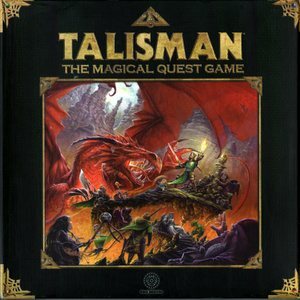 "Talisman - The Adventure: has over 60 new cards, new characters, 9 ghastly new Monsters, and 11 more Spells to zap them with! If that's not enough, there are also new Event, Object, Stranger, Follower and Place cards, to add even more variety to your Talisman game! What's more, we've also added 6 Character Sheets that allow you to keep track of cards, gold and abilities easily and neatly, so you can Devote all your attention to trouncing your opponents. But that's not all! Talisman - The Adventure adds 5 alternative endings. No longer can you be sure of finding the Crown of Command when you leave the Valley of Fire. In its place you might find the Demon Lord, Pandora's Box, the Dragon King, the Belt of Hercules, or the Horrible Black Void! Talisman will never be the same again! 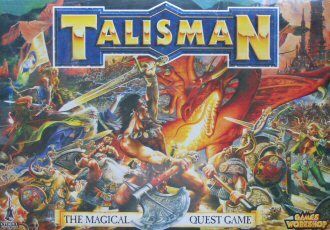 Talisman - The Adventure is an expansion of Games Workshop's Talisman - The Magical Quest Game, and is compatible with both first & second editions. You will need a copy of the original game to use this exciting new expansion kit, as it is not a game in its own right." "The Talisman Dungeon is more than just an expansion set for the world's greatest fantasy boardgame. Now you can brave the perils of the Dungeon in your quest for the Crown of Command; those who survive the Dungeon may find themselves closer to their goal - if they survive. 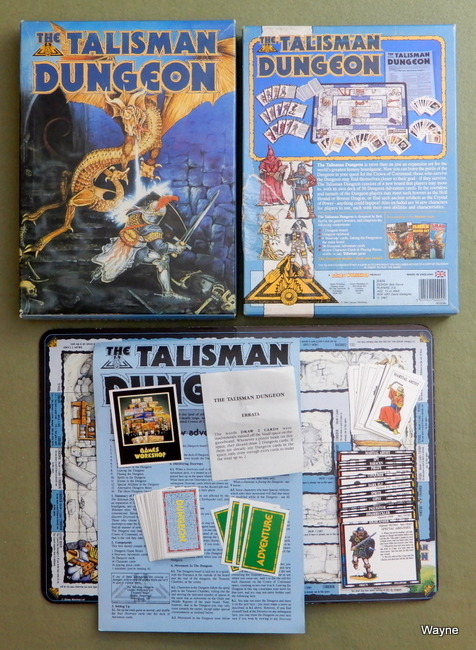 The Talisman Dungeon consists of a new board that players may move to, with its own deck of 36 Dungeon Adventure cards. In the corridors and tunnels of the Dungeon players may meet such horrors as the Hell Hound or Bronze Dragon, or find such ancient artifacts as the Crystal of Power - anything could happen! Also included are 14 new characters for players to use, each with their own abilities and characteristics." 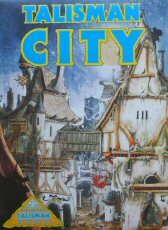 "This new expansion set for the Talisman fantasy board game includes dozens of extra Encounter cards, Spells, Objects, 6 new Characters, and an additional board of the streets, shops and other buildings in the Talisman City. Characters can visit places like the Magic Shoppe or the Armoury, and may even be put in jail. Characters can also pursue a new career such as Master Mage or King's Champion, earning enough money to buy special equipment or a boat passage across the river - taking them a step closer to the Crown of Command and ultimate victory." CHARACTER CARDS + Identical mini markers (8): Archeologist, Astronaught, Astropath, Chainsaw Warrior, Cyborg, Scientist, Space Marine, Space Pirate. 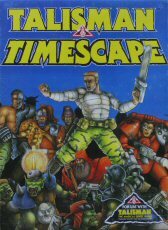 TIMESCAPE CARDS(42): Hand of Fate(10): Dimensional Rift(4), Orks, Supernova(4), Warp Storm. Enemy: Alien(10): Astral Hound, Alien Spores, Behemoth, Star Predator(2), Sun Worm, Psychic Parasite, Space Vampire, Will o Wisp(2). Stranger(2): Omnipotent Being, Time Travelers. Object(17): Alien Artifact(4), Anti-Grav Platform, Battle Armour, Chameleon Suit, Combat-Enviro Suit, Force Shield, Gyro Compass, Jet Pack, Medikit(2), Mining Laser, Power Glove, Psi-Helmet, Warp Belt. Follower(3): Battle Droid, Star Sprites, Symbiote. PURCHASE CARDS(12): Chain Sword, Combat-Enviro Suit(2), Gyro Compass(2), Jet Pack(2), Mining Laser(2), Power Axe, Psi-Helmet(2). MISCELLANEOUS: Timescape Board, Timescape Data Sheets(4), Rule Book. 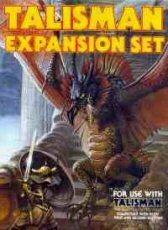 Expansion contains 87 new Adventure cards (including 20 dragons and wyverns), 4 new Character cards (Dragon Priest, Dragonrider, Dragon Slayer, and Questing Knight), 4 character stands, rule sheet, and Dragon King card. CONTENTS: • Game Board • 11 Character playing pieces (miniatures) • 11 Character cards • 1 Rules sheet • 129 Adventure cards • 30 Spell cards • 40 Purchase cards • 5 Tower cards • 6 Talisman cards • 6 Toad cards • 30 Strength counters • 30 Craft counters • 30 Lives counters • 20 Experience counters • 32 Coins • 12 Alignment markers • 6 Toad counters • 6 Dice • 1 Painting guide. "Enter a world of fantastic heroic adventure, where magic really works and monsters roam the land. 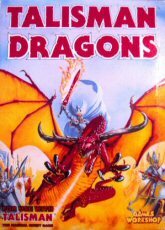 You are an adventurer on a quest to retrieve the fabled Crown of Command from its fearsome guardian, the Dragon King. You must find one of the Magic Talismans that will allow you to enter the Dragon King's lair and then defeat him in mortal combat. On your quest you will encounter powerful enemies, discover friends and magical artifacts, and meet strange beings. Finally, when you have gained sufficient power, you can confront the Dragon King in your bid to secure the Crown of Command. Talisman is a game played in a mythical world of dragons and sorcery. As a Warrior, Wizard, Elf, Dwarf or one of seven other characters with special powers, each player must set off on a quest to find the Magic Talisman. The journey will be filled with danger - monsters, traps and evil beings are waiting to defeat your player-character. With skill and luck you will survive to find the Crown of Command the greatest treasure of them all. Only then will victory be yours. This box contains everything you need to play Talisman, including a beautifully illustrated full-colour gameboard, over 200 colourful playing cards, dice, counters and an easy-to-understand rules sheet. Talisman also includes 11 superbly detailed Citadel Miniatures, hand-crafted to the highest standards by the talented Citadel Miniatures design team. Talisman's full-colour artwork and magical setting make it the most colourful boardgame ever. The easy to play rules, beautiful board and cards, and superb Citadel Miniatures make it the ideal introduction to fantasy gaming." "alisman® is a game played in a mythical world of dragons and sorcery. As a warrior, priest, wizard, or one of eleven other characters each with their own special powers, players must embark on a quest to find the magic Talisman. This journey will be filled with danger: monsters, traps and evil magic are all waiting to defeat you. With skill and luck you will survive to find the greatest treasure of them all -the fabled Crown of Command. Only then will victory be yours! * Piles of plastic Strength, Craft and Life Counters and Gold Coins!